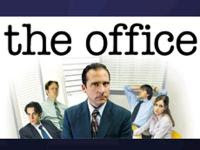 The two episodes of The Office last night were not quite back-to-back. Amy Poehler's new sitcom, Parks and Recreation, was sandwiched in between. Although PnR featured the same mockumentary style and Jim Halpert's ex Karen (Rashida Jones), it doesn't quite live up to its predecessor's standards. Amy Poehler is pretty funny--I loved her line about dealing with an angry public: "What I hear when I'm being yelled at is people loudly caring at me." Anyway, Michael's new venture had a shaky start. Pam shows up for her first day as a salesperson at the Michael Scott Paper Company perky as ever. "Apple started in a garage. We’re starting in a condo so we already have a leg up on Apple." Michael on the other hand is overwhelmed and channels his anxieties into making mounds of French toast. He asks Pam what shape she wants hers in. "Square is fine," Pam replies. With Michael undergoing an egg-covered meltdown, Pam quickly diverts him by starting a list of do-able goals. Like song parodies. I loved the interplay between Pam and Michael. Jenna Fischer was brilliant in both episodes. Michael recruits Vikram from the telemarketing center and Ryan from his job at the bowling alley to complete his "dream team." Then the four head over to the Senior Center to hit up Michael's Nana for investment money. When her investment club rejects him, Vikram bails on the venture. Pam starts to get cold feet as well. "I was just feeling impulsive--I should have gotten a tiny tattoo on my ankle!" she wails. Michael calms her saying, "I do my best when people don't believe in me." He manages to get some office space (a closet under the bathroom actually) at the Scranton Business Park where he runs into his nemesis, Charles Minor. "The Michael Scott Paper Company is about to open a big ol’ can of whupass on the Dunder Mifflin Paper Company," Michael tells Charles. There's a power struggle between Pam and Ryan over use of the laptop or who should make copies. Pam, trying to change her image from receptionist to salesperson, refuses but confesses, "And the worst part is I like making copies!" Michael blows a gasket saying, "I don’t make copies I’m the boss. I make originals!" The pancake luncheon (with square pancakes) is not a rousing success, although Pam manages to make one connection. Her cold feet get even colder and she tries to get her old job back from Charles--but that doesn't go well since the position has been filled. The bickering in the basement office takes its toll with Michael almost about to admit defeat telling Pam and Ryan, "I once had a dream I was eating a peanut butter and tunafish sandwich and it was delicious..."
As he's about the segue into how something that original seemed like a good idea can turn out to be a bad idea, Pam's contact from the pancake luncheon calls and places an order. Meanwhile, Jim continues to struggle with being on the outs with new boss Charles with Dwight gloating, "Oh no, the new boss does not find Jim adorable!" When Andy's mirroring technique of pretending to like soccer scores him some brownie points with the unyielding Charles, Jim tries the same tactic saying he played soccer in school. This leads Dwight to up the ante by suggesting that Charles and Jim should play soccer together. Jim admits: "I did play soccer in school. From second to fourth grade. I was on the orange team." When the office goes out at lunch to all play soccer, Jim's lie is exposed when he ducks and lets the ball smash Phyllis in the face. The best part of the show was the potential rivalry between Andy and Dwight over new receptionist, Kelly. Andy tells Dwight, "The last thing I want to do is step on your funk, man!" But their impromptu jam session turns into a weird version of Dueling Banjos (actually Andy was playing banjo, Dwight played guitar) when Kelly (the new Kelly) enters the breakroom and starts singing along to John Denver's Country Roads. Although they initially attempting to impress Erin--upping the stakes in virtuousity with Dwight singing in German at one point--they end up impressing each other and remaining friends. LOST: Dead is dead...or is it?